Today, I’ve had the pleasure of interviewing Tamika Smith, who hasn’t let her illness hold her back in life. She’s an amazing young woman who keeps a positive attitude in everything she does. She has had Type 1 diabetes for two years and keeps on moving forward with everything life has to offer. First off, what type of diabetes do you have? Type One Diabetes. I was diagnosed when I was 19 after about 3 months of symptoms. 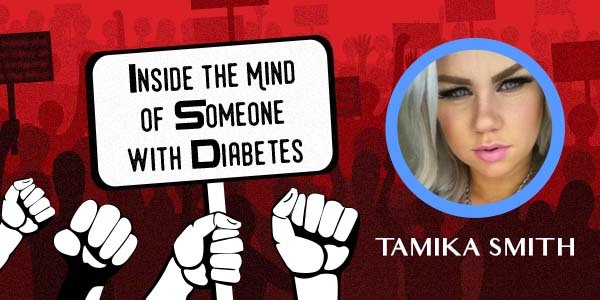 How were you made aware you had diabetes? I was diagnosed on the 5th of November 2014. It all started with my Mum picking up on my symptoms. I was sleeping a lot, drinking liters of liquid a day and constantly losing weight no matter how bad I ate. On the 31st of October she took me into a pharmacy that had free health checks. After only drinking one glass of orange juice in at least 12 hours my blood glucose level was 19.4 mmol/L (around 350mg/dl) and I was told to get to a doctors asap. As this was a Friday afternoon I couldn’t get in until Monday. Monday came around and I went in, the doctor was really concerned with my level but as I had eaten that morning he was unable to do the glucose test. I came in at 8am on the Tuesday morning ready to do my test. I remember the horrible taste of the drink and I can remember just pouring it down my throat as quick as possible just to get rid of it. 3 blood tests within 2hrs, it was like I was a pin cushion. Later on in the day, I was just about to start work and I got the phone call. “Hey Tamika, we’re going to need you to come in first thing in the morning, we have the results”. I can remember just bursting into tears, I didn’t want this. I called my Mum and she made the 2-hour trip down to come with me. I can’t begin to think about she was feeling during that drive. Wednesday morning, I went into the clinic and I was told “you have Diabetes”. the rest of the day is a blur. I was in and out of doctors’ appointments, seeing educators and a dietitian, giving myself my first injection. It was a whirlwind couple of days but luckily I wasn’t hospitalized like I know a lot of recently diagnosed Diabetics are. What is the typical day in the life for you? So first thing I do when I wake up is I check my level, if its good that’s great if it’s a little low or high I fix it when I have my breakfast. I usually like to leave it at around 8mmol/L (145mg/dl) in the morning because I work a fast paced job and I usually won’t get a lunch break for quite a few hours after breakfast. I get into work and usually just run around in a restaurant for probably about 4hrs before I have lunch. Depending on how busy it’s been or if I’m working a super long day depends on what I’ll have for lunch. Less carbs if it’s not busy or a little bit more if it has been. I’ll then work for bit longer until I finish my shift. If I’m testing a little low after work, I’ll usually have a little afternoon snack of a protein bar. I then get home and usually head off to bed for a little nap before dinner. Once I wake up I test again, make myself some dinner and then usually eat whilst watching some Netflix. After dinner do the usual shower, get ready for bed, one final test and just before I nod off, I have my injection of long acting insulin. Describe one of the scariest moments since your diagnosis. There was a short period of time when it had been about 18months since I had been diagnosed. I was sick of being a diabetic and I’d stop taking my insulin. Looking back now I don’t know how I made it through a day, I was constantly exhausted. There was one day at work, which I don’t remember all too well where not taking my medication really affected me. I’d been at work for maybe only an hour and a half and I began to feel really unwell. I can remember just needing to sit down and wanting to sleep. One of my coworkers found me and asked what was going on. I told him I think I need to be sick so he covered my work as I went upstairs to try and get whatever was in my stomach up. I was probably in the toilet for about 20 minutes, with my fingers down my throat. I couldn’t even keep down water. After I’d gotten it all up, I went back downstairs to work and took it easy for probably the next hour until I felt fine. The very next day I was back on my insulin. How do you cope with the constant battle of trying to maintain a proper balance with your blood sugars? I take each day as it comes. I’m going to have good and bad days just like everything else in life. The one thing I hate the most about being a diabetic is the time it takes up. I usually feel like everyone I’m with when I eat out have almost finished their meals by the time I’ve checked my levels and have taken my insulin. What was the reaction when you found out you had diabetes? I was pretty okay with it all. I was really unwell before I was diagnosed so it was nice to have an answer. I don’t believe that it was hard on my family either way. I’m lucky enough to live in a country that has a great NDSS (National Diabetes Service Scheme) so my diabetes supplies are subsidized a lot. I also come from a very close, small family who have raised me to be a tough little cookie. I like to believe that what happens in my life happens for a reason and I can either sit in the corner and cry about it, or get on with my life. How often do you test your glucose levels? What insulin do you use? I’ve only ever been on the NovoRapid FlexPen as my fast acting and Lantus FlexPen for my long acting. What would you like people with diabetes to know? You aren’t alone, and this fight will only get easier over time. I don’t really get or need support from anyone. I’m quite independent that way. I’ve just moved to a different city so I’m finally able to see a proper Endo and hopefully get some more information about getting a carb ratio and maybe look into getting a CGM. What Is Your Biggest Diabetes Fear? What is one positive thing that diabetes has brought into your life? It’s really encouraged me to live a healthier life. I was living off junk food before I was diagnosed and now I watch pretty much everything I eat.